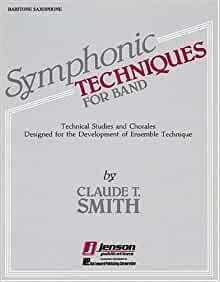 Claude T, Smith has combined his years of experience working with bands all over the world to develop this creative ensemble techniques method that gives all you need to warm-up your group and systematically improve your ensemble. This powerful resource includes.... Over 150 studies built around 32 technical exercises. Varied meters...All major and minor band keys. Carefully notated articulations and dynamic nuances. Long-tpne version of the major and minor scale precedes each exercise. 13 chorales in the full range of keys. A wide variety of styles. ...And, of course, each exercise is full of the creativity of one of the worldÕs most respected composers.